Note; this article is particularly interesting as regards the activities at Port La Nautique. A dolium was a large container made of fired clay, oval in shape, with a wide mouth and rim. The dolium had no neck or handles and could measure up to six feet in height. Some dolia (dolia is the plural of dolium) had a rounded body that tapered into a flat base, while others were totally rounded. They were lined with pitch or wax in order to contain liquids and solid foods. Some dolia had a capacity of 50 quadrantals, that is, 346.5 gallons. Much of what we know about the dolium in antiquity comes from ancient Latin literature. These sources help us to define the dimensions, shape, and basic usage of the dolium. Much information comes from Latin texts about agriculture, significantly De Agri Cultura by Cato the Elder, Res Rustica by Varo, Res Rustica by Columella, and the Res Rustica by Palladius. This gives us an insight into the life and culture of ancient Rome in terms of their use of the dolium. Another major source is the Digest of Justinian. It is a collection of quotations from earlier works of Roman jurists that discuss the importance of the integration of dolia in ancient Roman society. These sources define the dolia as the largest type of earthenware vessel ever made by the Romans. Dolia were used on land for the process and storage of foodstuffs. They were used in places of production such as farmhouses, and selling points like taverns and town warehouses. Dolia were also used in theatres for their acoustic qualities (presumably for special sound effects). Dolia were manufactured by travelling specialist potters or by workshops also involved in the production of architectural ceramics. The two methods of storing dolia were to either keep them buried half way in the ground or stored standing under a roof. They were used to hold goods such as wine, grape husk, olive oil, amurca, wheat, and other common grains. Unlike the amphora, the dolium was not an accessory - with amphores, one got the amphore free with the wine! Dolia were also used in relationship with transport facilities such as merchant ships and storage places like harbor warehouses. From discoveries, we can see how two or three rows of dolia were sometimes positioned along the keel of a merchant ship, apparently cemented in place to prevent their shifting. The high prices of dolia act as evidence to indicate that their acquisition into maritime transportation represented a very substantial investment of funds. Also, given their great weight and bulk, their replacements must have represented a very large inconvenience. Thus, extraordinary caution and care must have been placed when handling the dolia to preserve and maintain their useful life. They could remain in use for 20 or 30 years. There have been at least seven shipwrecks discovered carrying dolia, dating between the 1st century BC and the 3rd century AD. Three of the most interesting and identifiable shipwrecks that lend themselves to study of dolia are the Diano Marina, the Petit Congloue, and the La Giraglia shipwrecks. The Diano Marina shipwreck (Liguria, Italy) was discovered with fifteen dolia still intact. Due to its relatively deep underwater location, it was protected from both natural and human disturbances, which allowed for a detailed study on the position of dolia on board this Roman merchant ship. The dolia were found to be two different shapes, which corresponded to two different positions on board the ship. Four long, almost cylindrical dolia were located in a line along the keel of the ship, while ten shorter, rounded dolia were divided into two lines and laid at the sides of the central dolia. This type of disposition seems to be directly related to the structure of the ship and most likely implied that the lips of all the dolia were lying at an even level. Regarding the total capacity of the dolia on a Roman ship, only in case of this Diano Marina shipwreck is it possible to reach an estimation. Based on the calculations of the capacity of the central cylindrical dolia and the surrounding rounded dolia on board, the total capacity of the dolia on board would have been 9,500 gallons. The Petit Congloue shipwreck (Marseille) was discovered in a similar environment as the Diano Marina shipwreck. However, in the "Petit Congloue" shipwreck, the dolia are all unfortunately silted up to their shoulders, making it impossible to distinguish their different shapes. But, their disposition clearly shows the same pattern of three lines being parallel to the keel as in the Diano Marina shipwreck, which allows us to further specify that the vases in each line were actually sized compared to the ones in the neighboring line. It is important to note here that even though this shipwreck does not allow us to study the shapes of these particular dolia, the sporadic recovery of single dolia from the sea shows two different and distinct shapes: cylindrical or rounded. 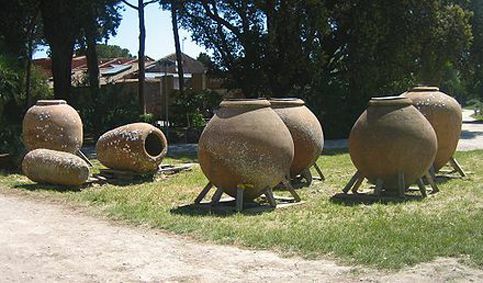 The La Giraglia shipwreck, discovered off the coast of Corsica, was intended to transport dolia in bulk as these large globular jars were placed in the hold as the ship was being built. It was carrying at least eight dolia and its excavation gives insight into the ship's build and how such vessels contributed to new patterns of trade in the western Mediterranean. This so-called cistern boat was an innovation in ship construction, intended to respond to changes in the production and transportation of wine brought about by Roman expansion. 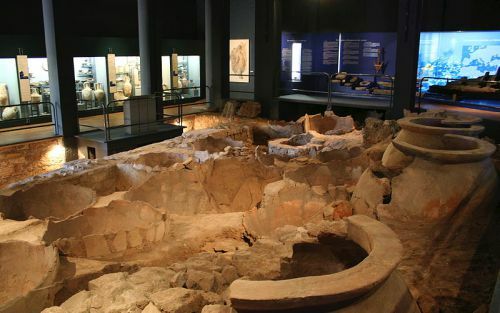 The cistern boats began trading during the Augustan Period, and continued till the 2nd century AD. This shipwreck was traumatic, there is little left to be excavated and studied of the hull. The hull planking is also poorly preserved, but there were, however, thirteen strakes that were uncovered that give us a representation of the entire ship. The strakes were fastened together by pegged mortis and tenon joinery and assembled in the classic shell first construction. The spacing between mortises and the width of the mortises is very tight and they also appear to be slightly wider than the tenons. It is believed that the space left within the mortises was intended to compensate for possible misalignment of opposite mortises. They were arranged in a straight line, rather that alternating from the inboard to the outboard edge and the back inboard in order to prevent the wood from splitting. Twenty-six frames were also identified and recorded. The large quantity of nails indicates their significance as a strengthening element in the assemblage of the frames with the planking. The La Giraglia was a medium sized ship, but possessed a few rather unusual characteristics because the discovery and study of the twenty-six frames reveal that 58.8% of the preserved hull was composed of oak. The use of oak solely for the hull planking has never before been seen in the Mediterranean. However, one cannot assume that the entire hull of the ship was made out of oak just from the overwhelming amount of oak in the discovered fragments. It could have perhaps only been used for the bottom of the hull, which would certainly be an interesting characteristic for such cistern boats. The ship builder might have thought it necessary to use this hardwood because the weight of the cargo was concentrated in the center section of the ship. Overall, there were six species of wood that were used in the construction of the La Giraglia: oak was used for the frames and tenons, beech and elm also for the frames, ash made up the small pegs used in the hull planking, and fir and two other types of oak. The shipwright obviously knew how to use the available species appropriately. Dolia in the maritime museum at Ostia, the port of Rome. Whatever the answers to the questions raised about the dolia vessels or cistern boats, these ships must be considered not only as a technical innovation of their time, but also as a daring enterprise. The presence of huge containers in the hold presented an obvious danger. The rupture of a full dolium would have caused almost two tons of wine to pour rapidly into the hold, which could have resulted in a sudden destabilization and capsize of the vessel. 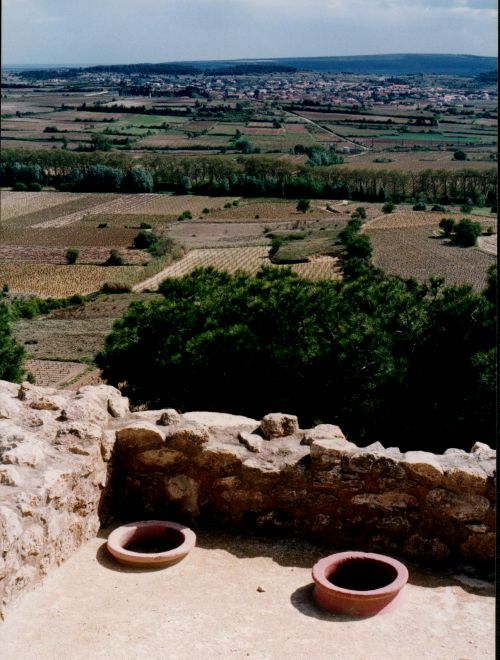 In spite of the advantages of dolia over amphoras, the risks may explain why cistern boats disappeared in the second century. A new dolia shipwreck has recently been discovered on the seabed just off the coast of the Tuscan island, Elba. The Roman ship was perfectly preserved, containing nine intact dolia that measured two meters high and five meters round. Experts estimate the ship to be twenty-two metres in length and date back to the time of the first Roman empire. "This is the first time a complete, inviolate wreck has been found," Michelangelo Zecchini, an archaeologist who works for the Forum UNESCO commented. "Just the number of containers and their superb condition makes this a truly astounding discovery." Excavation remains slow and tedious as the shipwreck lies under a metre of lime, but archeologists are hoping that this discovery will provide valuable information and details about the layout and cargo of the ship, as well as cargo ships like it. This will help historians better understand and study the shipping routes of the Mediterranean in antiquity. ProMare, a non-profit organization that promotes marine discovery and archeology around the globe, is currently heading up the excavation process. It began on September 2, 2008 and represents current attempts to use modern technology in the excavation process. So far, it has been discovered that the ship was carrying ten dolia with a capacity of 400-450 gallons each. Study and analysis of the use of dolia on board Roman merchant ships shows that it is not much different than their use on land. "It seems that dolia were made in a shape that allowed them to fit perfectly inside a ship in order to leave minimal empty space. The central row was composed of the highest cylindrical dolia, while the two other lines, laid on both sides of the central one, were composed of shorter and more rounded vases. The very tight disposition of the dolia has led to the deduction that these containers were never removed from their places on board ship and that when they carried wine, it had to be poured in and out at the ports-of-call. This conclusion is supported by the fact that all the dolia found on Roman port buildings were imbedded in the ground, and therefore were also irremovable." Dolia have been found in considerable quantities in every step of a system of food supply which was related to the overseas trade. In fact, the archaeological evidence confirms the existence of a commercial organization, which would buy a certain food commodity, most likely wine, stored in dolia. The same commodity may be been further transported to other dolia in other [warehouses] located closer to possible buyers. All the archaeological and literary evidence support this vision of the role of dolia in maritime commerce. Un site in Dordogne, perdu.